I just returned from a two day trip to L.A. where I had the great fortune to visit with Mohnish Pabrai, agruably one of the most successful investors today. I enjoyed the opportunity to hear Mohnish speak to a group of business school students at USC, chat with him privately, and have dinner with him. Most of what Mohnish had to say he gives to you in his newest book, The Dhandho! Investor, a must read for any true investor. Nonetheless, it pays to listen very carefully to Mohnish as one will take home some pearls of wisdom. "All the great investors have given you their methods. Read everything Buffett has to say...he tells you how to succeed in investing. Joel Greenblatt, wrote the The Little Book that Beats the Market for his young daughters. In the book he tells you how beat the market. His website, http://www.magicformulainvesting.com/ screens for the best stocks. Find the best ones and you will beat the market. Patience is the key"
"When I buy a stock, two things ALWAYS happen: immediately after I buy, the stock tanks and once I sell the stock, it really takes off"
"When I invest in a business I have a very good idea about the intrinsic value of the business. I never have an exact figure, but I know the business well enough to arrive at a very comfortable range with a high degree of probability. If in invest in a business, I now wait three years before I sell if the price has gone down as long the present intrinsic value has not deteriorated. This routine comes from Mohnish's investment in USAP, which I won't go into great detail here. Basicailly, he bought the stock, after which it proceeded to go down by two thirds. After a reassessment of the underlying economics of the business, Mohnish concluded that the intrinsic value has actually gone up. This continued to be the case over the next two years and the stock remained dormant. Sure enough, the market caught on and USAP climbed to a point where Mohnish had more than a 100% unrealized gain. Now, the security is up over 200% from his investment point and Mohnish has since exited with only a very minor position. 1. Understand your investment well and make sure you have a thesis that clearly explains your reasoning for investment. This should be no more than 3-4 lines. 2. Approximately 80% of a stocks price movement occurs during 10% of time. Timing the market is a fools game. Exercise patience. Dinner with Mohnish, was very entertaining to say the least. He's full of humor and witty wisdom...much like a guy in Omaha. Mohnish was kind enough to keep a copy of my Letter to Potential Limited Partners regarding the formation of the Gad Investment Partnership. I only asked him to take look and he was very kind enough to do so. As we all know Mohnish eats his own cooking and invests all his money in the Pabrai Investment Funds. Nonetheless he was impressed with what he saw and I hope to someday catch up with his phenomenal pace. On that note, I am happy to report that the formation of the Gad Investment Partnership is moving right along. I appreciate everyone's interest. I have been studying business, and specificially the workings of Graham and Buffett since I was 15. My setup will be very much like the original Buffett Partnerships of the 1950's and the Pabrai Fund in 1999. Accredited investors should contact me directly regarding investment interest. By now most of us our familiar with this statement from Warren Buffett or have heard something similar. Well, it was this quote that got everyone so curious about how Buffett would be able to generate such a outstanding performance today. In order to really understand what Buffett had in mind when making this remark, you need to know this: Buffett is not the same investor in 2007 as he was during the 1950's and 60's. Let's go back and look at Buffett's early years compared to today. Workouts essentially constituted of investments which were dependent on a specific corporate action for their profits rather than a general advance in the price of the stock as in the case of undervalued situations. Work-outs came about through sales, mergers, liquidations, tenders, etc. This is arbitrage in the purest sense. With work-outs the risk is that something will upset the applecart and cause the abandonment of the planned action, not that the economic picture will deteriorate and stocks decline generally. Control situations involved an investment stake substantial enough in which Buffett was able to take part in corporate decisions. At times these positions could make up to 20-30% of the capital under Buffett's management. An example of such a situation was the purchase of the common stock of the Commonwealth Trust Co. of Union City, New Jersey in 1957. Buffett concluded that the stock, priced at $50 per share, had an intrinsic value of about $125 on a conservative basis. Buffett accumulated 12% of the stock before it reached a price of $65 in which case he neither bought or sold. By the following year, he had negotiated a private transaction and sold the shares for $80, with the current market price quoted at 20% lower than his sale price. The most famous control situation, of course, was Berkshire Hathaway. The 50's and 60's was a good period for these types of investment situations and Buffett took advantage by committing large portions of his partnerships capital. He was concentrating his portfolio in the best ideas regardless of market environment. While Buffet is indeed an extraordinary stock picker, he was a brilliant businessman, and his track record of the 1950's and 60's lay evidence to that. With only millions to invest, the opportunities for workouts and control situations were easier to exploit. With tens of billions to invest today, Buffett simply cannot employ the same investment strategy. To be sure, he always sees hidden value in his investments, but you have to remember one important thing: Berkshire is so huge and well diversified that Buffett's investment decisions are now about keeping the company going in line with economy as opposed to beating the pants of the Dow Jones. Over a third of Berkshire is ultimately going to the Bill and Melinda gates foundation, so Buffett needs to really make long-term stable investments and not necessarily workouts situations. One might argue that USG is a workout situation, but the corporate action --emerging from bankruptcy-- has already occurred. USG is simply a fantastic business that is waiting for the next cyclical demand boon in wallboard (an economic event). Berkshire's investments in Posco and most recently, Burlington attest to this. In end all this means is that Buffett is still the greatest capital allocator in the history of mankind. He has a unique ability to shift gears when the situation calls for it. There a lot of other points I skipped over, like Munger's influence on Buffett's investment philosophy with the purchase of See's candies in the 1970's. 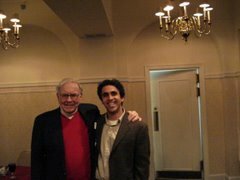 My goal here was to simply show evidence that one can not and should not analyze Buffett's investments of today with the same parameters of Buffett's investments during the early years. By now, I am sure everyone is aware of Buffett's 10.9% stake in Burlington Northern Sante Fe Corporation. Like typical Buffett, he is buying railroads just at the exact moment when the industry is predicted weaker growth. Purchased at around $81.40 per share, Berkshire now holds about 39 million shares. Plus Berkshire is supposedly buying shares in other yet to be disclosed railroads. Consider that Burlington hauls enough low sulfur coal to produce about 11% of the country's electricity needs. If you have any long-term favorable outlook for U.S. energy demand, then Burlington makes perfect sense. We know Buffett does, as years ago he publicly stated that Berkshire can be expected to make "substantial" investments in the electric/utility industry.